I am wondering how long after I post a reply that it shows up on the board. I posted last week and hasn't shown up yet. Thank you. I try to approve the messages on the board once or twice a week. We've been really busy here lately and I just didn't have time to approve the messages. How blessed are those whose way is blameless, who walk in the law of the Lord. How blessed are those who observe His testimonies, who seek Him with all their heart. They also do no unrighteousness; they walk in His ways. Thou hast ordained Thy precepts, that we should keep them diligently. Oh that my ways may be established to keep Thy statutes! Then I shall not be ashamed when I look upon all Thy commandments. I shall give thanks to Thee with uprightness of heart, when I learn Thy righteous judgments. I shall keep Thy statutes; do not forsake me utterly! How can a young man keep his way pure? By keeping it according to Thy word. With all my heart I have sought Thee; do not let me wander from Thy commandments. Thy word I have treasured in my heart, that I may not sin against Thee. Blessed art Thou O Lord; teach me Thy statutes. With my lips I have told of all the ordinances of Thy mouth. I have rejoiced in the way of Thy testimonies, as much as in all riches. I will meditate on Thy precepts, and regard Thy ways. I shall delight in Thy statutes; I shall not forget Thy word. SOW IT IN THE WORLD." whose height was six cubits and a span? I found a typo in this pattern... the error has been corrected in blue. Thanks to Cameo I realized I omitted part of the cluster stitch instructions. The pattern has been corrected in blue. Hi- I love your web site. 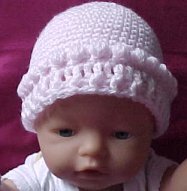 I am trying your puff stitch baby hat. I am confused . Push the puff to the front of the work. If you encounter yarn tails that are too short to thread a needle and then sew into your project... weave the needle through the stitches and then thread the yarn tail through the needle and pull it through the stitches. I love your site. It has sooo much info, which I have really enjoyed. I am a beginner at crocheting and this site has really helped me. I also like the fact that you share your relationship with Jesus. Wow, what a ministry you have. Do you by chance have the pattern for a dish towel with the crochet handle? If so would you please send it to me? The first link is for a topper that the entire towel is inserted through a loop beneath the skirted part of the top. My name is Greg and I am trying to find a pattern for a cat sweater so that my mom can make my cat a sweater. Can you let me know specifically what she would need to make it? The pattern is adjustable for any size dog or cat. Worsted weight yarn is recommended with a G size hook, but you can substitute any yarn and hook size to achieve the look you want. I am very upset with this afghan. 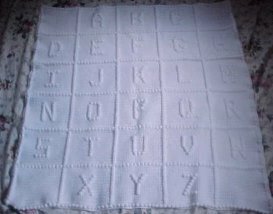 I am working on the ABC afghan but the backside looks better than the front. I do not think I made a mistake. I do not understand what I did wrong. Even though I push the puff stitches to the front they do not stay. Do you have any suggestions? I was thinking about trying to iron with a damp cloth to see if they would stay. 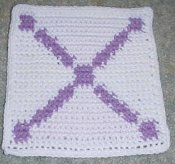 The puff stitches stayed to the front side when I make that afghan. Did you check the puff stitch instructions again? Once you get the nine loops on the hook, you yarn over and draw through 8 loops and then yarn over and draw through the last two loops. Then when you work the next stitch that should keep that puff stitch from moving. 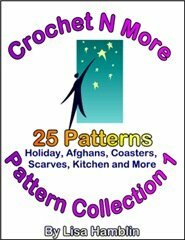 Thank you for sharing all of the crochet patterns on-line. My 84 year old mother just made several of the Christmas Trees that we will give as gifts. She wanted me to find a pattern for a Christmas Wreath that was full size so she can put it on the wall and maybe give that as gifts also. I found ornament wreaths but nothing bigger. Do you have any patterns for a larger wreath? but now we can't find it. Again, thank you for sharing. to make something quick and pretty easy. Glad your Mom is enjoying the patterns. 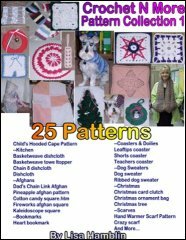 As for full size wreath crochet patterns... I haven't seen many. Not sure the exact size of the poinsettias... but a few on a wreath would surely look nice. I think a yarn covered styrofoam wreath embellished with flowers or holly would be perfect. 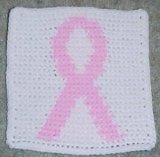 "dc in next 7 dc" this means you work one double crochet stitch in each of the next seven double crochet stitches. I'm a counselor who helps coordinate support groups for visually impaired adults. Many participants have a condition known as macular degeneration, which makes it difficult for them to distinguish facial features. I had just been assigned to a new group and was introducing myself. Knowing that many in the group would not be able to see me well, I jokingly said, "For those of you who can't see me, I've been told that I look like a cross between Paul Newman and Robert Redford." Immediately, one woman called out, "We're not THAT blind!" Murals Inlet, S.C., bills itself as the "Seafood Capital of South Carolina." It has so many seafood restaurants that it is hard to decide which one to choose. My wife and I were trying to do just that when we came upon, of all things, a steakhouse. It seemed busy, perhaps because it had adapted to its environment. A sign out front read: "Catch of the Day -- COW!" I WAS IN A BANK when a man entered with a rather large dog on a leash. When he asked if it was okay to bring his pet into the building, a bank official answered, "Yes, provided he doesn't make a deposit." Could you please write and tell me because if it isn't enough money then I will become a dentist. With a scornful look, the nurse turned to me and snapped, "Honey, he's not THAT sick!" A Sunday school teacher asked her class, "What is prayer?" "That's a message sent to God at night and on Sundays, when the rates are lower." Unfortunately, getting a new passport required a new photo. As I handed my ten-year-old passport and the new picture to the clerk, I sighed. "I like the original better," I told her. "Trust me," she said. "Ten years from now, you'll like this one." 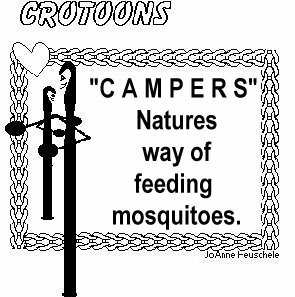 For several years my husband and I have made a conscientious effort to get our family to eat more healthful foods at meals and for snacks. The children often express their discontent with this choice. One afternoon at the grocery store I purchased paper towels that were in a new, recyclable earth-tone color. When I got home and my 17-year old son pulled them out of the bag, he exclaimed, "Oh no! Whole Wheat towels!" "Well, we decided to call her Pork Chop when we got her from the vet," answered the second lady. "But after we got the vet bills for her, we changed her name to Filet Mignon." "After 20 years on the job, I know garbage when I see it!" I emptied the can and left. "Dear Professor Trash, the garbage can is the garbage!"